If you are looking to buy play equipment for your park then we would advise you to choose a strong and sturdy swing set for your playground. It has always been the favorite equipment of children. 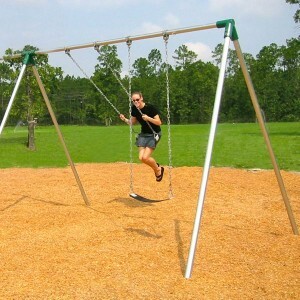 There are many brands offering swing sets to the customers at great prices. Before placing your hand on any, consider certain things that would lead you to the right equipment for the kids. Before looking out for a swing set, measure the area where you will install it in the playground. This will provide you an idea of what type of swing set be appropriate, leaving the adequate space for the kids to perform other activities. Materials like metal and wood are commonly used for making the swing sets. No matter which swing set you choose, make sure it can easily withstand the adverse weather conditions. The swing set should be strong and can stand firmly in the ground for years on end. Manufacturers usually make the swing sets in flat base and A frame base. You can choose the equipment as per the slope of your playground. Buy the swing from the IPEMA certified manufacturer. Ensure that the equipment you are selecting has been constructed as per the guidelines defined by ASTM and CPSC. There should be essential anchors installed in the requisite places in the play set for the safety of kids. It would be wise to purchase the equipment from the supplier who also offers high quality swing set accessories to the customers.